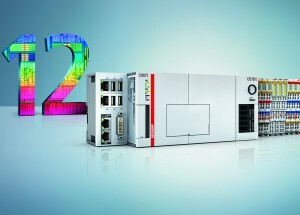 SAVAGE, Minnesota, November 30, 2016 – With first reveal at the SPS IPC Drives 2016 trade show in Nuremberg, Germany, the popular CX2000 Embedded PC series from Beckhoff is being expanded with many-core control technology versions. These powerful, yet exceptionally compact CX20x2 devices will integrate Intel® Xeon® D processors, each with 4, 8 or 12 CPU cores of the 5th generation Intel® Core™ microarchitecture, and manufactured using 14 nm process technology. This impressive level of performance was previously unavailable in a DIN rail-mounted controller format. The 4, 8 and 12 processor core options provide ample processing power and parallelism, even for extremely demanding automation tasks. Optimal multi-core support via TwinCAT 3 automation software from Beckhoff makes it possible to distribute the individual tasks of a control process across the many available CPU cores. This means that the computing load can be planned in fine detail to achieve the best-possible processor efficiency. Another important feature that enables these impressive performance increases is the separate graphics card. Since Intel® Xeon® CPUs do not incorporate graphics cards, the CX20x0 devices integrate a separate graphics card, equipped with 2 GB RAM. Separating the CPU RAM from the GPU RAM prevents unwanted interactions between the two computing units. The high power density created by the CPU and GPU makes it necessary to incorporate a fan for heat dissipation. A cable-free plug-in connection facilitates easy fan replacement if required, and the regulated fan speed can be queried in the PLC software. All standard interfaces of the CX2000 series are also available for use with the new many-core units: 2 x GBit Ethernet, 4 x USB 3.0, DVI-I (including VGA) as well as the flexibly-configured, factory-fitted multi-option interface. All existing CX2000 plug-in modules – those attached from the left and right – can also be used with the new devices to ensure maximum flexibility.